The reduced hours schedule for our libraries went into effect Saturday (March 20). The Central library is now closed on Saturdays because of the draconian 10% mid year budget cuts exacted from the library budget by the mayor and approved by the city council this past December. That 10% cut was more than any other General Fund Department had to sustain. Think about that- our largest library which supports your branch, and serves all citizens- is now closed on Saturdays. And the hours have also been cut at our branches, which I will address further on. We should all be asking “Why is the mayor balancing the budget on the back of our library system?” I suspect the answer is because he can. We didn’t stop him. My husband and I spent an hour and half at the Central library Saturday. We spoke to 70 (!) people who came up during that time period and who found to their surprise that the library was closed. Forty eight people wrote down why they had come to the library and signed their names. 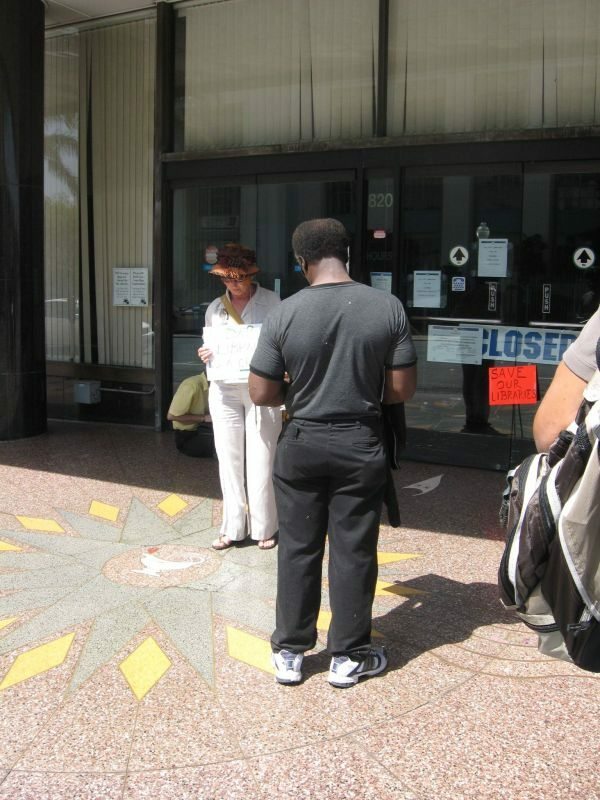 I will deliver these responses to Mayor Sanders and Council member Faulconer. We provided the mayor’s phone number and encouraged people to call him and the council office. A number of people gave me their email address and asked to be informed of library developments. Why did those 70 people come to the library? Their responses were eye opening. Our neighbors went to the Central library to work on job resumes, research job opportunities and file for jobs on line. They came for the large selection of books and because they love to browse. They came to check out books and videos. One person came to get audio books because he is visually impaired. People wanted to use the internet and access their email. One man said “We don’t all have computers.” Half of the people have branch libraries that could not provide the resources and materials to meet their needs. Jobs. Education. Business. Staying informed and connected. The pleasure of reading. Libraries are important to our family, our friends and our fellow citizens. Libraries are a core City service. Why are our elected representatives disproportionately cutting and chronically underfunding our libraries? Many of our branch libraries will be closed Sunday. I will be at my City Heights branch to do the same thing- inform and ask people to tell the mayor why their library is important to them. I hope all of you library advocates and Friends members will do the same. I urge you to go to your branch library when it is closed this Monday and future Mondays and Sundays. Talk to your friends and neighbors and ask them why they went to the library and deliver those answers to the mayor and your council member. Do this for a month. Invite the press and council rep to talk to the people. If you can’t make it this week, schedule events every week through April. It will take months before people are aware of the new schedule. A number of districts will have elections this year. This is your opportunity as library supporters to invite those candidates to your Friend’s meetings and get a commitment from them to support our library system. Please do not underestimate t he power each one of you has. The people who use libraries should be the strongest supporters. Give them an opportunity to get involved. Inform them about the budget situation and ask them to contact the mayor and their council representative. The people I spoke to today thanked me. They will thank you too. In the past citizens have successfully overturned reductions of hours. We have met with each council district, the mayor’s office, the Library Commission and the Library Foundation. We have been disappointed in their response. Now it is up to the citizens to decide how important their library services are to them. When the people lead, the leaders follow. Give your patrons the information they need to restore library hours. That’s what librarians do. Please pass this info on to your Friends groups, because I don’t have all of them on my list. We should never underestimate the power of one. Thanks so much Anna and Rich for ensuring that we’re aware of these dark days. Imagine ! The Central Library of our great city closed on Saturdays! Incredible. 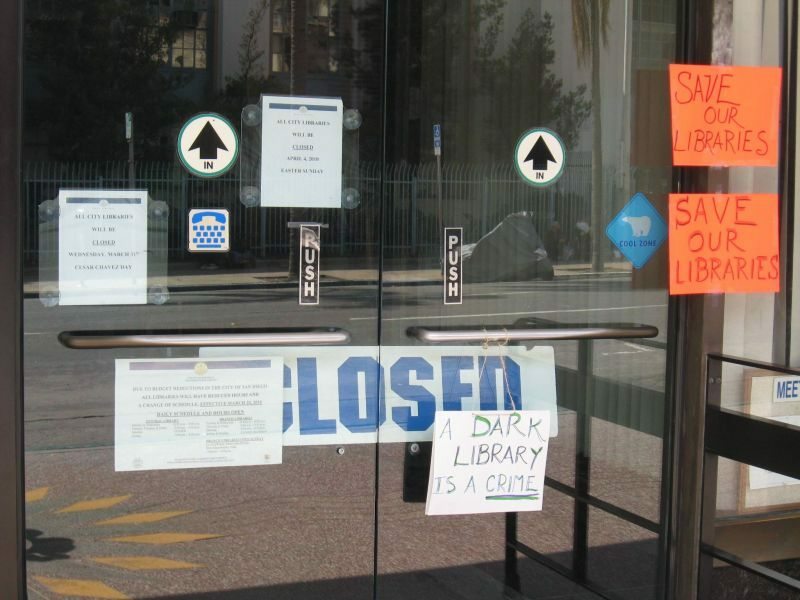 But I think there is some logic here: the less days the libraries are open, the less the public will be educated. Liam Dillon from voiceofsandiego also went to the Central Library this past Saturday. His article says that the mayor’s office has said there will be no cuts to the library budget next fiscal year. Remember that. I certainly will. I cannot remember in the last 40 years that the Central Library has been closed on Saturdays. It was briefly shuttered on Saturdays but for only two weeks because of the outcry from the public. The politicians then found the funds to keep it open. The city somehow always finds the money for their favored projects. Many people need the resources of the Central Library because it has some books and documents that cannot be found anywhere else in the area including the UCSD libraries. I believe the San Diego Libraries have the longest standing collection in the area. My friend completed his PHD thesis using the government documents–going there every Saturday because even UCSD didn’t have the government documents that the Central Library has. The mayor has already severely damaged our libraries so it doesn’t matter that he won’t come back again to cut so more out of the budget. 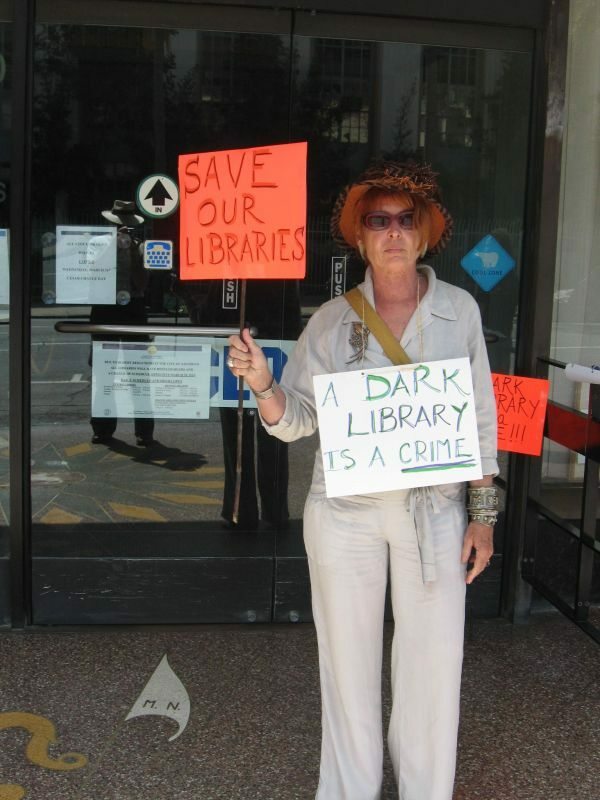 If you want the Central Library open again on Saturday or want your branch library hours back, we need to tell our friends and neighbors about these draconian cuts and ask them to call the mayor and city council about their unacceptable actions. Thank you Anna, full of grace, for your efforts. And Rich!!! Awesome what you are doing to make us aware of this crack in our democracy.